The National Coalition Against Domestic Violence has invited the High Point Police Department to present information about our Offender Focused Domestic Violence Initiative (DVI) that was begun in 2012 at its national conference in September. Based on the Violent Crime Focused Deterrence model, the DVI has helped reduce repeat domestic violence offenses in High Point. Almost 3500 offenders have been “put on notice” over the past six years of implementation. And while the program is not perfect – domestic violence continues to happen – it has made a difference, more than other strategies used in the past. Read more about our DVI in this article from the Greensboro News and Record. The Middle District of North Carolina, US Attorney’s Office, has published their March 2017 newsletter. This is a great way to see what is going on around our District related to crime and violence reduction efforts! We are proud to share the news that the National Network for Safe Communities (NNSC) at John Jay College of Criminal Justice is launching a new intimate partner violence intervention initiative, based on the successful intervention model we developed here in High Point. Three pilot cities will be chosen to replicate the model. This initiative is being funded by a $1.6 million grant from the Department of Justice’s Office on Violence Against Women. Gretta Bush, HPCAV’s president has been named as a NC 6th Congressional District Community Hero of the Month by U.S Representative Mark Walker. Rep. Walker came to High Point in July and presented Mrs. Bush with a certificate and the United States flag that was flown over the Capitol on May 21, 2015. Rep. Walker attended a call-in and was impressed with what he saw and heard, especially Mrs. Bush’s ability to tell the truth to the participants with graciousness and their acceptance of her and the message they receive. The Community Hero of the Month is a way for Rep. Walker to honor people within the 6th Congressional District who are making a difference in our communities. Preliminary 2014 year end statistics from the High Point Police Department show, once again, that the Focused Deterrence model successfully reduces crime. Since we started using this model in 1997, High Point’s violent crime is down 67% even though our population has increased by 44%. Yes, we still have violent crimes take place here. But we continue to work towards less crime and making High Point a safer place for everyone. We’re getting there! On October 16, 2014, the office of the United States Attorney, Middle District of North Carolina, recognized Mr. Zaki Khalifa for the donation of the building at 792 North Main Street in High Point for use by High Point Community Against Violence, Inc. (HPCAV). 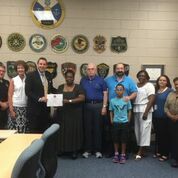 The presentation was made on behalf of Ripley Rand, U.S. Attorney by Rob Lang, Assistant U.S. Attorney and original member of High Point’s crime reduction strategy task force. “Thank you for the example you set,” said Lang as he reflected on what the building has meant to High Point’s efforts to reduce violent crime. Mr. Khalifa is a widely respected and long time resident of High Point. He is well known as the founder and owner of Zaki Oriental Rugs and has been active in many community efforts. The building provides HPCAV with permanent office space and serves as as a location for related prevention and intervention programs. Included is the Life Construction Program that teaches construction skills and provides hands on learning opportunities in a workshop in the back of the building. One thousand fewer calls. Since fully implementing the Offender Focused Domestic Violence Initiative just two years ago, High Point Police Department reports receiving 1000 fewer calls asking for a response to domestic violence incidents. This is good news for High Point families and for our community as a whole. Cities across our nation continue to consult with High Point and to implement this Initiative in their jurisdictions. Roanoke, Virginia; Chula Vista, California; and East Baton Rouge, Louisiana to name a few. Jim Summey, D. D., Executive Director of High Point Community Against Violence, Inc. has been named a Senior Fellow in the Justice Programs Office (JPO) of the School of Public Affairs at American University. Senior Fellows provide multi-disciplinary and multi-jurisdictional perspectives to help guide justice system initiatives. 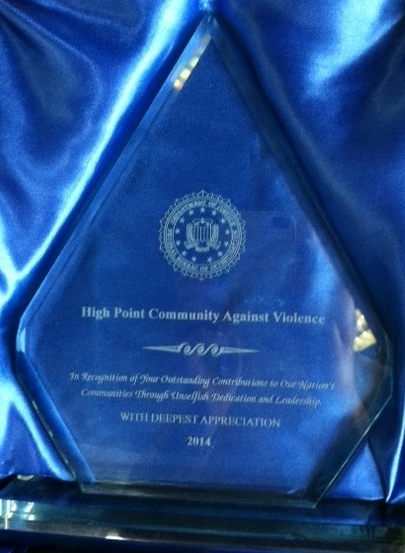 Summey was invited because of his work with the violence reduction efforts here in High Point. “This is an exciting time to work in the justice field and your perspective and experience will greatly enrich our work,” wrote Caroline S. Cooper, Director of the Justice Programs Office at American University in the invitation. Summey began working as a volunteer with HPCAV while he was the Minister at English Road Baptist Church in High Point. He became Executive Director in 2009. For more information about the Justice Programs Office and Senior Fellow Program, visit the American University website.